This entry was posted in General News and tagged tiger, War Eagle VI on January 28, 2013 by Wire Eagle. War Eagle VI has regained her eagle eye. 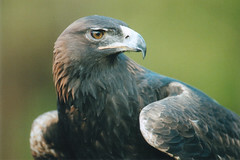 Surgeons at Auburn University’s College of Veterinary Medicine removed a cataract from the golden eagle in mid-December. In the month since the surgery, recovery has gone well for the eagle also known as Tiger, who at 33 has surpassed the average age for her species.